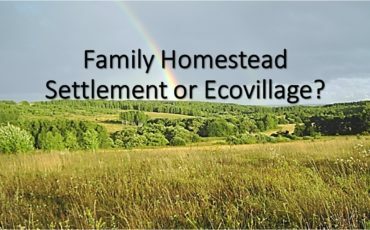 What is Created – Family Homestead Settlement or Ecovillage? There is a question — positioning in society of the idea of Family Homestead Settlement. The initiative group arranges the land, start building and make habitable the taken areas. Then comes the presentation of their plots and then it turns out that people create the family homestead as ecovillage. After all, if family homestead is created and then the second, the third it turns out the sum of family homestead. And actually, it turns out otherwise — ecovillage. Weird. But what about the Idea of a family homestead? It has nothing to do with the world view that positioned in the society as an eco. Ecovillages are traditional or intentional communities whose goal is to become more socially, culturally, economically and ecologically sustainable. Ecovillages are consciously designed through locally owned, participatory processes to regenerate and restore their social and natural environments. The link which is given here, says that ecovillages of Grishino, Kovcheg, Edinstvo, Luchezarnoe, Majskoe just continue the Western movement of the early 1960-ies. Here. Hippies, GEN — Europe — here is the ecovillages movement, presented to the public. By the way, this movement has enlisted in its ranks also the Kovcheg settlement. But do the settlers know about it? It seems that there is no Ringing Cedars of Russia book series, if there are ecovillages, the idea of which doesn’t belong to Megre. There is also movement of ecovillages. But the builders of Family Homestead, did they not feel this substitution? People not thinking about in which movements they participate? But it’s not only the substitution of the concept. There is the discrepancy of our appeals to the authorities behind this. Here we are creating an ecovillage, and then we are asking the Law about the Family Homestead. It’s nonsense. Such law is not needed for settlement. There are other principles of organization. But the Family Homestead Settlement needs such a Law. But there are no such settlements. Not stated. And no one will grok, that someone assumes under the guise of “ecovillage”. The name of the settlement defines the worldview of all participants in its creation. This is in regards to the ecovillage. But there is another concept with which is not all clear. This is definition of “Family Homestead”. It would seem it’s all clear — Family Homestead Settlement, the settlement of the same generation. But what does that have to do with settlements consisting of family homestead created by not unrelated families — is not clear. It turns out that such a settlement suggests that in its composition only Family Homestead of relative? I assume that this substitution occurred by inadvertently.